Bhutan is the land of the thunder dragon. Lying between China to the north and India to the south, the Druk Kingdom is a land of immense natural beauty with rich ancient culture and tradition. 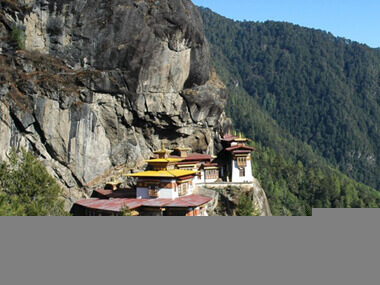 Bhutan is one of the few unexplored tourist destinations in the world. Often referred to as Shangri-La, Bhutan is a beautiful tourist destination. Buddhism is the national religion of Bhutan. Buddhism is believed to have been first introduced in Bhutan the 8th century B.C. The Bhutanese people love themselves to be called Drukpas. Dzongkha is the national language of Bhutan. The Tibetan origin people dominate the northern, eastern and western part of Bhutan, while the Nepalese origin people dominate the southern part. Bhutan was opened to the modern development in the 1960s after the years of self-imposed isolation with the building of the first schools, hospitals and roads. When Bhutan was closed to the outside world, the then Bhutanese government took these Nepali origin people to accelerate the development process. However, it is pity to say that more than 1, 00,000 Nepali origin Bhutanese people have been taking asylum in eastern districts of Nepal due to political crisis in Bhutan. In the new millennium, Bhutan stands as a unique nation that blends modernization with its tradition and culture. Bhutan's unit of currency is the Ngultrum (Nu. ), with 100 Chetrum = 1 Ngultrum. The Ngultrum is fixed to the value of Indian Rupee. Tourists are advised to carry their money in form of traveler's checks (preferably American Express) with a little cash (US Dollars), which might be needed for incidental expenses. A few places like handicraft shops accept VISA card but beyond that any card (ATM, VISA) will not be accepted. Approximately $1 = Nu. 43. Classic Bhutan tours are escorted by well-versed and knowledgeable guides, trained and certified by Department of Tourism of Bhutan. Most of the guides are English speaking but Japanese, French, Italian, Spanish, German, Russian speaking guides could be also provided with prior information and additional cost. Due to wide range of temperature and climatic conditions it is advisable to bring appropriate clothing. For protection against cold-layered clothing is better than a few thick ones, so choose your cloths accordingly. Cloths should preferably be made from natural materials, which allow the body to breathe better. You will be offending people if you walk around in skimpy or tight fitting clothes. Although there are normally opportunities to wear shorts, we would advise women to wear skirts or loose trousers, men should not wear singlet. During visit of monasteries, Dzongs and other religious institutions you should not wear shorts, hats and should be well dressed. The country's exquisite postage stamps, lovely hand woven fabrics, carved masks, woven baskets, wooden bowls, handmade papers, finely crafted metal objects, Thangka paintings are the items mostly purchased by travelers in Bhutan. Buying and selling of antiques is strictly forbidden in the Kingdom. The Bhutanese authorities strictly prohibit the export of any religious antiquity or antiques of any type from the country. Cameras, video cameras, computers and personal electronic equipment may be brought into the country but must be listed on arrival and will be checked on departure. Following with the recent ban of selling cigarettes and tobacco products in the country a traveler is allowed to carry the certain quantity of products in the kingdom for his or her own consumption.